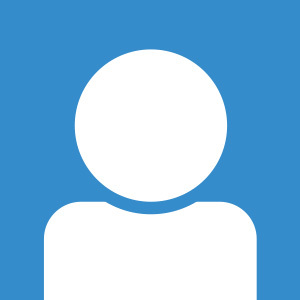 Today, we are pleased to introduce a new guest author, Jorge Molinero of Amphos 21, a COMSOL Certified Consultant, who blogs about their new iCP technology. Along with several other parties, we at Amphos 21 have launched iMaGe, a multiphysics and geochemistry interfacing platform. The platform’s first product, iCP, connects COMSOL and PHREEQC, enabling the modeling of coupled Thermo-Hydro-Mechanical-Chemical phenomena. A large number of problems in porous media frequently involve several coupled phenomena, such as liquid flow, solute and heat transport, elastic and plastic mechanical deformations, and geochemical reactions. Handling all the different physical and chemical processes and their interactions in a single model is not a simple task. This is in part due to the difficulty of integrating different intrinsically coupled processes over varying space and time scales. The integration of multiphysics and geochemistry in porous media is known as reactive transport modeling, referring to the fact that groundwater and solute transport is coupled to geochemical processes, specifically water-rock interaction phenomena. Reactive transport modeling is a powerful tool for challenges in the oil, mining, and nuclear industries, mainly related to underground environmental issues, such as the safety assessment of radioactive waste disposal, mine hydrology and waste management, deep injection of fluids, and carbon capture and storage activities, among others. 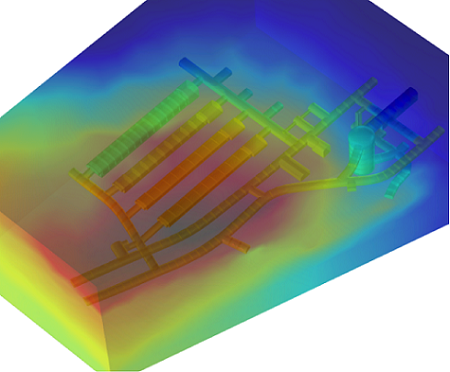 Simulation of the underground repository of low and intermediate level radioactive waste in Sweden. The image shows pore pressures at the vicinity of the repository. Over the last two decades, considerable efforts have been devoted to the modeling of coupled problems in porous media. Despite significant advances, the most widely used numerical codes are still tailored to solve a specific set of physical processes and lack the capabilities needed to extend their range of application. Additionally, the simulation tools available are oftentimes “domestic” in the sense that they have been developed in universities for specific research objectives. Therefore, they lack appropriate quality assurance (QA) and technical support required by industrial users and decision-makers. This is why the COMSOL Multiphysics® simulation software draws the attention of Amphos 21. The software provides multiphysics, multipurpose, and easily extendable simulation capabilities. As a consulting company working for the major radwaste agencies and oil and mining corporations, Amphos 21 is used to facing very different environmental and geological challenges that require powerful and flexible computational resources. We were particularly attracted to the Java® API functionality that allows for the development of interfaces between the COMSOL software and other simulation tools. This ease-of-interfacing even inspired our new concept: iMaGe. iMaGe is a platform for interfacing Multiphysics and Geochemistry, where Amphos 21 and several partners share the efforts and know-how in order to develop solutions for advanced reactive transport modeling. The first product of the iMaGe platform is called iCP, which stands for interface COMSOL-PHREEQC. iCP aims to provide a flexible and efficient platform for the solution of large-scale Thermo-Hydro-Mechanical-Chemical (THMC) challenges. PHREEQC is the most widely used geochemical simulator, developed and distributed by the U.S. Geological Survey. The full geochemical capabilities of PHREEQC can then be combined with COMSOL Multiphysics, thanks to iCP. This interfacing solution opens the way to a huge number of new opportunities for possible couplings in the underground environment. Multiphase flow, pore-scale simulations, and fractured rocks hydrogeology can be easily coupled with mineral dissolution precipitation, porosity clogging, cation exchange or surface complexation mechanisms. Typical applications are radionuclide migration in geological media, CO2 injection in deep reservoirs, mine dewatering, environmental hydrogeology, geothermal facilities, etc. 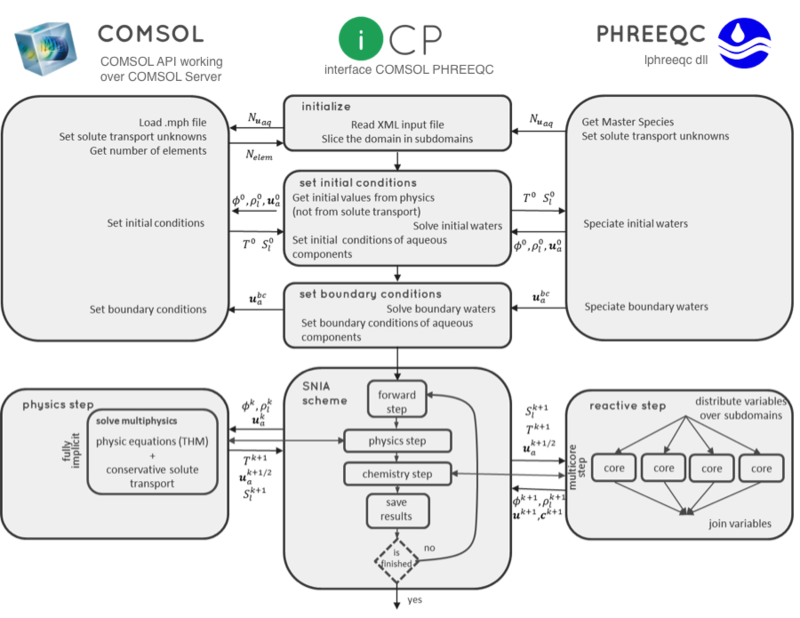 Flowchart of the iCP technology for modeling coupled THMC phenomena in COMSOL Multiphysics. A remarkable feature is the parallelization of the geochemical reactions, which in THMC applications is typically the most CPU-demanding process. In iCP, this parallelization is achieved by splitting the domain in contiguous subdomains where the reactions are solved with a single PHREEQC process. This approach provides computational efficiency to the tool, enabling the solution of fully-coupled large-scale problems. A project is now on-going for extending that development to MPI-based parallelization of iCP. The iCP tool has been developed in Java® so that it can be used in COMSOL Multiphysics without any additional software needs. If you’re interested in learning more about iMaGe and iCP, don’t miss the first iMaGe workshop and training event, which will be held in Barcelona, Spain on June 3-6, 2014. The event coincides with the official launch of iCP, so attendants will benefit from a permanent free license of iCP for academic and R&D (non-commercial) use. Learn more on the iMaGe events page, or by contacting modeling.solutions@amphos21.com. Jorge Molinero is a geologist with a Major in Hydrogeology and a PhD in Civil Engineering. Jorge has been working with coupled multiphysics and geochemistry challenges during the last 20 years. Nowadays, he is the Scientific and Technical Director of Amphos 21 Consulting, a firm with more than 100 employees providing services to the Nuclear, Mining, Oil and Gas, and Water Resources industries and authorities.